Running up and down the West Coast and as far east as Chicago, Dallas and even Boston (with a separate but coordinated program out of New York), “Awake” was masterminded by Jaquelynn Baas and Mary Jane Jacob of U.C. Berkeley. The coordinated events run the gamut from museum shows to contemporary performance art, from experimental Taiwanese dance and theater troupes to ancient Nepalese sand-mandala rituals, from academic symposiums to workshops on how to meditate. And Los Angeles is a major hub. The L.A. County Museum of Art, UCLA’s Fowler Museum, the Hammer Museum, Otis College and the Japanese American Cultural and Community Center are variously involved. For a religion that stresses the experience of the immediate moment and the transitory nature of material phenomena, Buddhism sure is responsible for a lot of stuff over the ages. 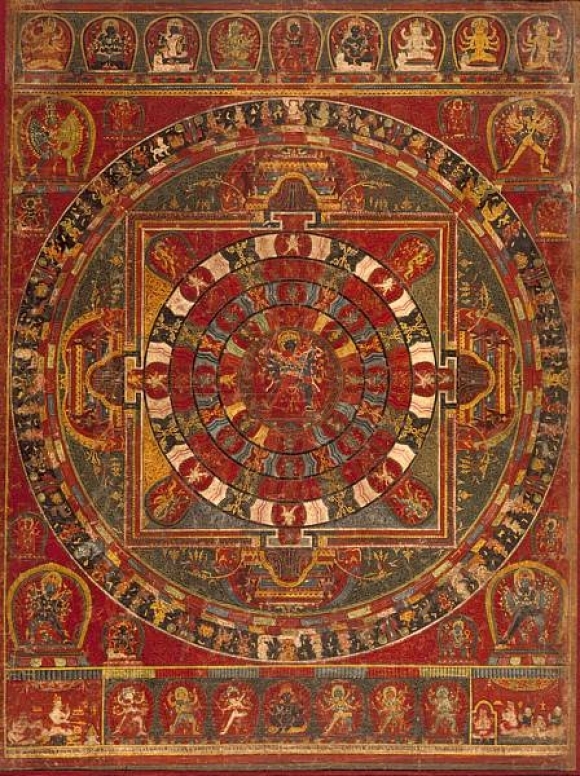 At LACMA, for instance, “The Circle of Bliss: Buddhist Meditational Art” collects 157 separate paintings, sculptures, textiles and ritual objects from China, Tibet, India and Nepal, all arranged to illustrate the Chakrasamvara Tantra meditation process. The exhibit offers scads of jaw-dropping works, including LACMA’s own Mandala of Chakrasamvara, a 15th-century painted cotton wall hanging in the Nepalese Newar tradition; a Tibetan gilt copper statue of the Dancing Vajravahari, a primordial goddess also known as “the adamantine sow”; more than a dozen national treasures on loan from beleaguered Buddhist monarchy of Nepal; and the first ever on-site creation of a Chakrasamvara sand mandala. Indeed, viewers will need more than one visit just to absorb the tremendous visual pleasures, let alone begin appreciating the profound contemplative visionary instruction they were, and are, intended to convey. The same pretty much goes for “The Art of Rice: Spirit and Sustenance in Asia,” a large exhibit at the Fowler Museum of Cultural History offering a slightly more secular, anthropological take on Asian traditions. The enormous spiritual symbolism of rice and the deep influence of Buddhism on all aspects of daily life, however, turn this into an essentially Buddhist collection of paintings, sculptures, ritual objects and paraphernalia from harvest festivals. And an even more explicitly spiritual exhibit is open simultaneously in another Fowler gallery. “From the Verandah: Art, Buddhism, Presence” – co- produced with the Hammer and JACCC – consists of an architectural installation comprising of a wooden verandah in the middle of a darkened gallery bracketed by two sunken Zen “gardens” – a marble Rice House created by the German artist Wolfgang Laib and a rectangle of cracked clay laid down by performance artist Hirokozu Kosaka. Viewers are encouraged to sit and contemplate in this environment, while an ongoing meditative performance work organized and choreographed by Joe Goode takes place in the shadowy periphery. LACMA and the Fowler are also offering a wealth of lectures, workshops, concerts, performances and film screenings to augment their exhibits. Whether you’re a devotee of Buddhism, curious about the connection between artistic creativity and Buddhism or just want to see a dazzling array of art, there really is no time like the present. “From the Verandah” and “The Circle of Bliss” are on view, at the Fowler Museum and LACMA, respectively, through January 4. “The Art of Rice” closes at the Fowler on April 25. For information about the Fowler, call (310) 825-4361, or visit www.fmch.ucla.edu. For information about LACMA, call (323) 857-6000, or visit www.lacma.org. Awake’s Web site is www.artandbuddhism.org.